There’s something about oddball heroes. Keep your Supermen and your Thors. Give me the heroes who have no great gifts – or worse – just weird gifts – and throw themselves into battle with the same determination and fervor as the gods of justice. They’re more human, they’re more relatable. If you have the powers of Superman or Wonder Woman, does it really take that much courage to get up in the morning and put on your spandex and head out the door to face whatever evil is brewing? As a kid, I was fascinated by Triplicate Girl in the Legion of Super-Heroes. Her power was to split into three identical selves. That was it. Awesome by itself, sure, but lame in comparison to heroes who could invade your mind or grow to giant size or toss lightning bolts. A month worth of nightmares, all for twelve cents. Yet she fought alongside all these young warriors, even Superboy and Supergirl. After one of her selves was killed – gruesomely disintegrated by Computo, her teammate’s creation, for bleep’s sake – she threw herself right into battle again, as Duo Damsel. – transforming me into Hiccup Lad! Yeah, I wouldn’t even make the Legion of Substitute Heroes. I could, however, become captain of the Inferior Five. That was the thing about DC Comics right through the mid-’70s – there was a place for just about everyone, whether you were fat (Bouncing Boy), a nerd (Brainiac 5) or ugly as sin (Ferro Lad). DC Comics were incredibly moral for their day – teaching that might never makes right. As long as your heart was pure and your intentions good, there was a place for you among the pantheon of heroes. 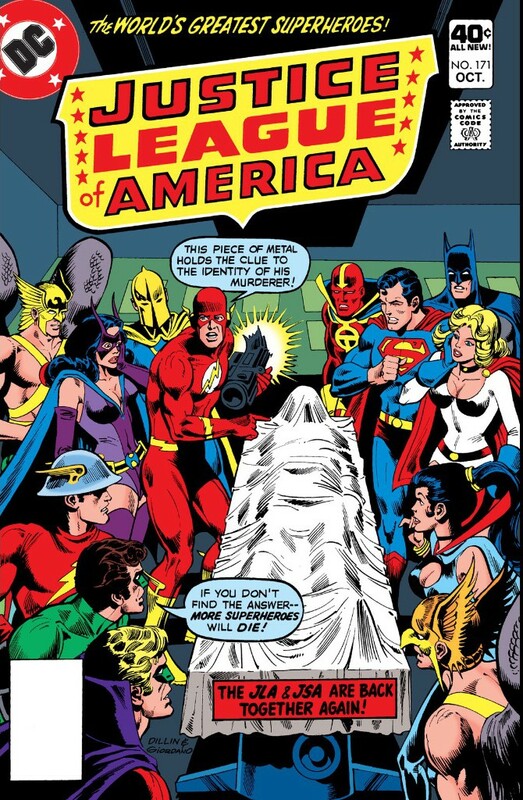 Oh, that sheet could be hiding anyone: “Justice League of America” No. 171. Mr. Terrific was my favorite member of the Justice Society of America. There was just something about him that captivated me, right from the first moment I saw him in “Justice League of America” No. 101. What was his story? What drove him? But that proved to be his last regular appearance in the annual JLA/JSA team-ups. Outside of a one-panel cameo, Mr. Terrific was the only JSA member not to make a comeback in the “All Star Comics” revival in the mid-’70s. In one issue, a letterhack wondered about his whereabouts. The editorial response: Mr. Terrific was a quaint hero whose time had passed. There was no longer any room for a hero with the words “Fair Play” emblazoned on his chest. And then there was one … fewer. When DC house ads for “Justice League of America” No. 171 warned a hero would die, I knew instantly the identity of the victim. 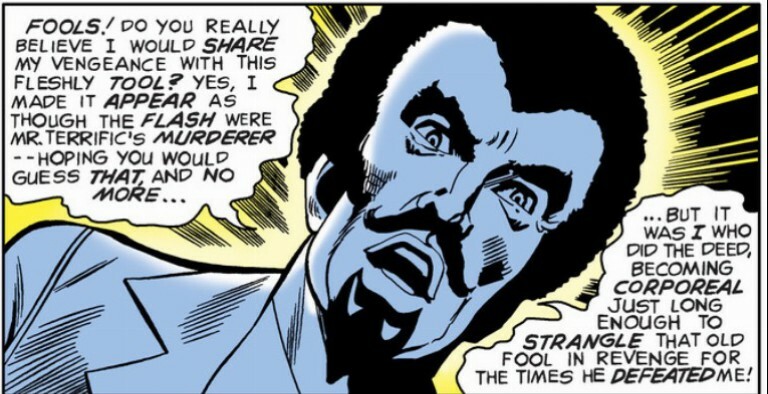 Gerry Conway had made a reputation as the guy who sent Gwen Stacy plunging to her death. He was apparently ready to spill more blood. 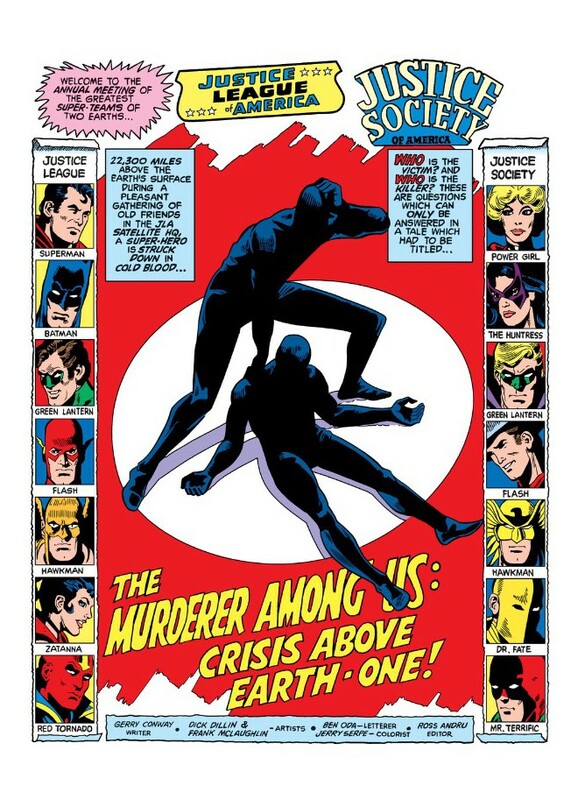 Yet the story, “The Murderer Among Us: Crisis Above Earth One,” cover date October 1979, started as a welcome change of pace. For years, the JLA/JSA team-ups had been in sort of a rut, every year forced to travel to Planet Meh to rescue/save/battle the Lost Heroes of Whatever. They were starting to turn into the equivalent of cape stew. Conway instead fashioned a locked room murder mystery. on a satellite 22,300 miles high in space. This two-parter was a chance for a more character-based story and feature what all fans really grooved on, the interactions between the members of the two teams. Beyond Conway’s choice of victim, he failed miserably at the climax. Mr. Terrific reveals that he came out of retirement to chase down an old foe, Spirit King. Right from the bat, readers are at a disadvantage: Conway created Spirit King for this story yet didn’t give much of an explanation of his abilities. He apparently can turn intangible like a mist and teleport. That’s just to start with. Why does Wonder Woman look so confused? Probably because she is not even in this story! Mr. Terrific suggests he has information that will be damaging to one hero. Before anyone can learn anything further, the satellite is rocked by an explosion. Part of the satellite is blown off into space. While our heroes are able to seal off the damaged area, they find Terry Sloane’s body in the wreckage. The explosion was just a cover. Mr. Terrific was strangled. – one of our heroes is a murderer! 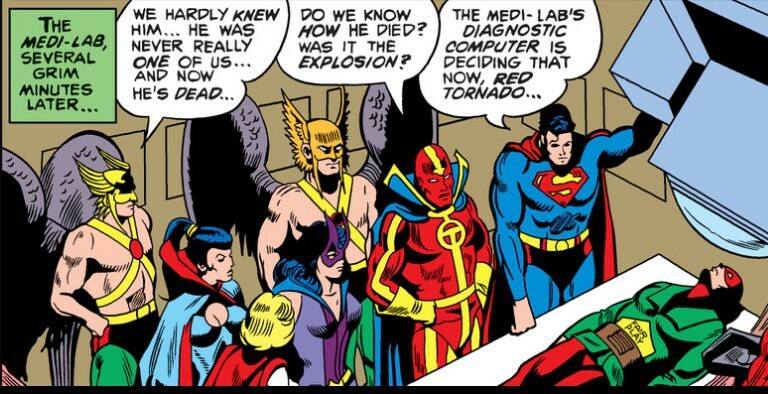 The obvious suspect is Earth 2’s Hawkman. How can you trust a guy in that gaudy headdress? What? Insult to murder: JSA chairman denies knowing the victim. Oh, shut up, Carter. Check out Huntress leading the investigation in “I Accuse …,” “Justice League of America” No. 172, cover date November 1979. 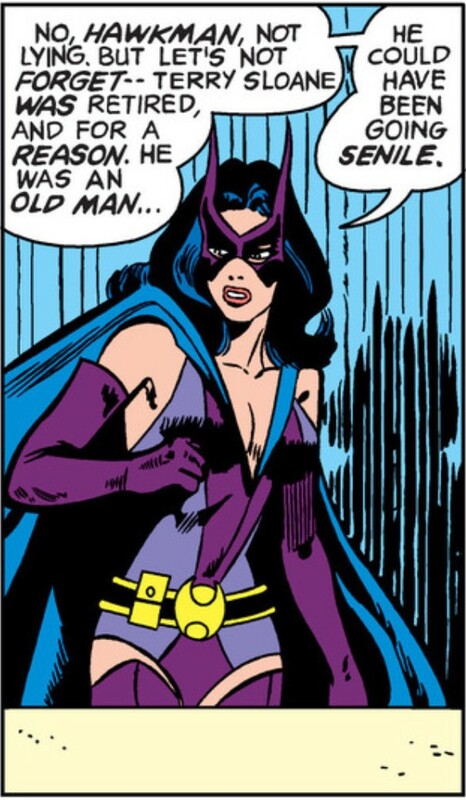 Huntress never has to worry about getting old; she is obliterated in “Crisis on Infinite Earths” in just a few years. For the daughter of the “darknight detective” (ugh), she sure is stupid: It’s canon that Earth 2’s heroes are about twenty years older than their Earth 1 counterparts. That would mean Terry Sloane is about 50, 55 tops – and in damn fine shape, too. – the killer is Jay Garrick/the Flash! But, no! The Spirit King reveals himself – he used the Flash’s body to get onto the satellite, emerging only long enough to kill Terrific with his bare hands. All it takes is one good exposition dump to explain it all. He re-possesses the Flash, zips into the transporter tube and escapes. The JSA takes off after him; the JLA congratulate themselves on not letting their witch hunt go too far. This is the first and only team-up to kill off a member and to have no resolution. It’s a rather sad, ignominious end to a hero whose career started in 1940. You, the readers, have to wait almost twenty years to see Spirit King actually apprehended for his cold-blooded murder, in “Spectre” No. 54, in 1997. In that same issue, Mr. Terrific’s legacy inspires tech billionaire and Olympic decathlon champion Michael Holt to take on the guise of Mr. Terrific. When Terrifics clash! : They actually did get along much better in JSA No. 42. Ironically, the best writing for Terry Sloane came years after his murder. In “The Justice Society Returns” and “JSA” No. 42 and Nos. 68-72, far more talented writers James Robinson, David Goyer, Mark Waid and Geoff Johns gave “the man of 1,000 talents” his due and more, with stories that displayed his courage and intellect and proved why he deserved to be respected, as a champion of justice in his own right and as a member of the Justice Society of America. In death, finally, there was some fair play. Update: DC readers had to wait 18 years for the final part of this tale, which revealed the reach of Spirit King’s dark scheme and the creation of the Modern Age Mr. Terrific. Here’s the rest of the story. Another great post! 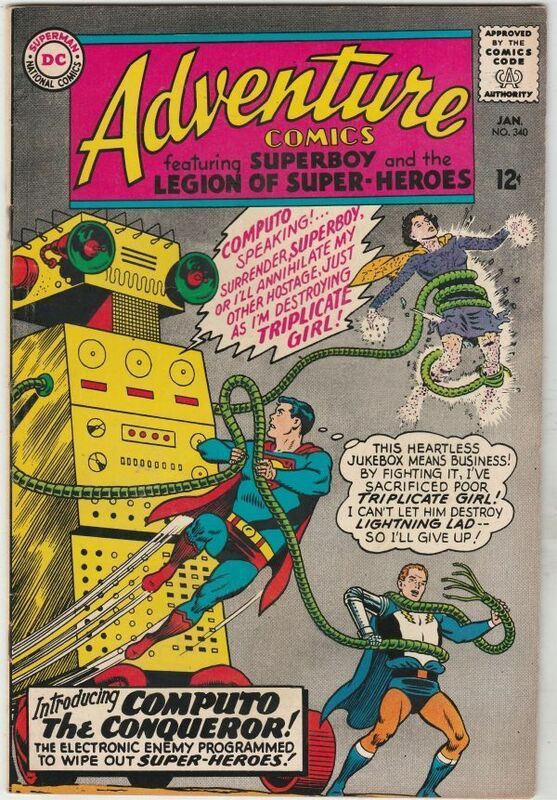 I loved the Curt Swan cover of the Legion and I can remember wondering about Triplicate girls usefulness myself. How about Matter Eater Lad?! I seem to remember knowing about Mr Terrific so he must have been used in one of the earlier JLA/JSA teamups? Did he actually have his own book back in the 40s? Keith, you really are on to something with Matter Eater Lad – perhaps the oddest hero to win full membership in the Legion. He’s useful if you’re trapped in a cell and need someone to chew the bars – but in hand-to-hand combat, what’s he going to do? Maybe we don’t want to think about that. As for Mr. Terrific, he had a feature in Sensation Comics during the ’40s. Some of his solo stories were reprinted in the JSA All Stars Vol. 1 – I highly recommend this book as it collects not only Mr. Terrific’s earliest appearances but also Wildcat, Hourman, Wildcat, the Atom and the original Red Tornado. Mr. Terrific was also my favorite golden age hero. The reason was that in an early jla/jsa crossover, the jla heros are changed into villains. 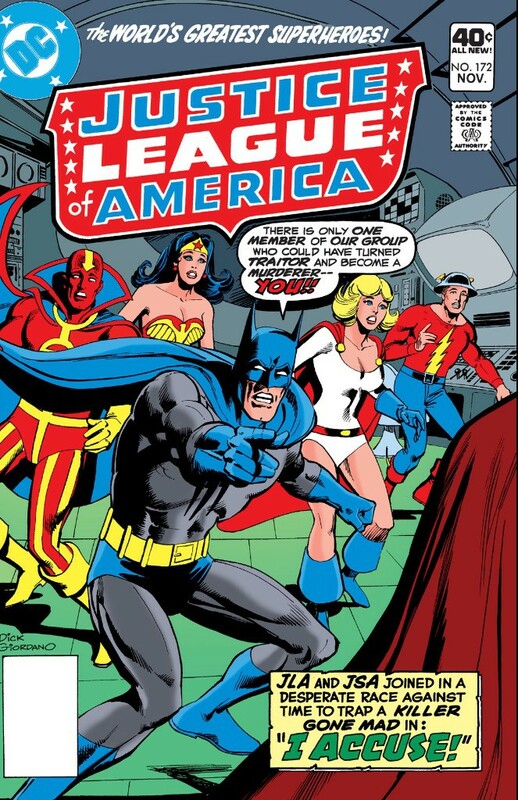 JSA challenges the evil jla and Mr. Terrific easily beats Batman. Come on, who doesn’t like a hero who is better than Batman. I’ve always thought of both Terrifics as Batman-without-the-angst. Terry Sloane became a hero because he wanted to and no one was better skilled – he was literally a man of 1,000 talents. Michael Holt suffered a grievous loss in the death of his wife but he never let that define him. Both tremendously aspirational characters. Excellent article about Mr. Terrific!! Kudos! (I have Justice League of America # 171, and # 172, where the Original Mr. Terrific, Terry Sloan, was murdered by The Spirit King. Now, I have to track down and buy The Spectre # 54, which you say came out twenty years later, from 1997. I do have one caveat about this article about the Original caveat (sorry.) 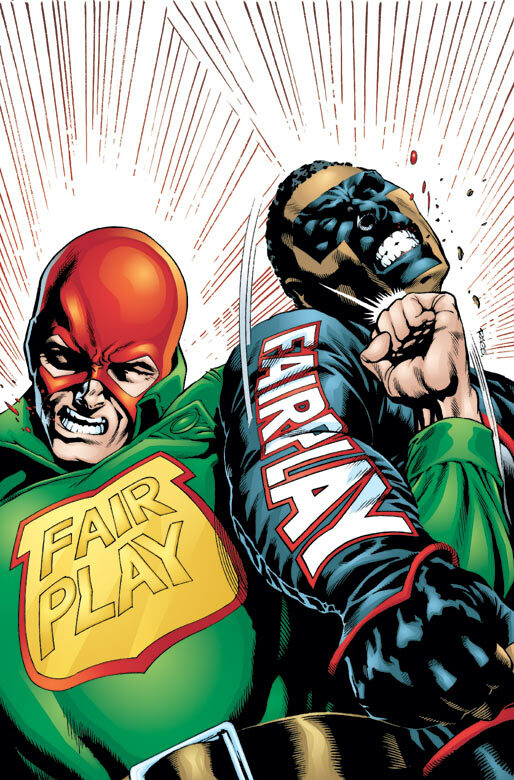 At the very end of this article about the Golden Age/-Silver Age Mr. (Terry Sloan) Terrific, it says this: (I cut and pasted it): ” In death, finally, there was some fair play. Update: DC readers had to wait 18 years for the final part of this tale, which revealed the reach of Spirit King’s dark scheme and the creation of the Modern Age Mr. Terrific. Here’s the rest of the story. ” I clicked on this link that says ‘Here’s the rest of the story’ ie: 18 years later, you said, which revealed the reach of Spirit King’s dark scheme and the creation of the modern Age Mr. Terrific.’ But when I click that link at the very tail end of the article, no matter how click that link, it continually brings me back to the start of the same Mr. Terrific article, not an additional page. (IS) there another page? Still a great article! Best Wishes, Phil Latter Cheers! If you are a fan of either Terrifics (and I love them both), I do recommend tracking down that “Spectre” issue. It was a welcome answer to a question DC had let linger for 20 years and it introduced Michael Holt. Impressive.